Announcement welcome to goldfinch woven ~ specializing in one of kind wearable art weaving utilizing the highest quality natural and sustainable materials. you can follow me on instagram @goldfinchwoven and on facebook at www.facebook.com/goldfinchwoven. welcome to goldfinch woven ~ specializing in one of kind wearable art weaving utilizing the highest quality natural and sustainable materials. Realistic looking great size and color. Very happy 9 year old daughter - she has started collecting cherries for reasons unknown, and she really liked these. Thanks! Layers of fringe just added to the shop! 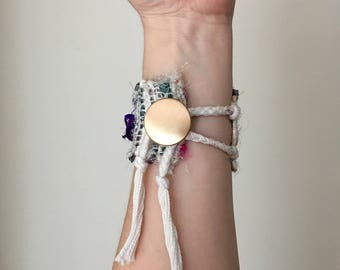 Recycled silk & cotton bracelets for Earth Day! 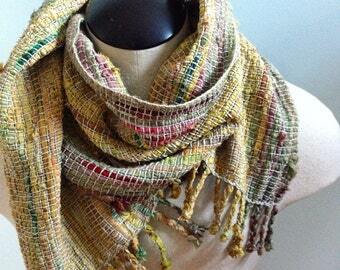 Newly listed ~ handwoven recycled sari silk scarf. Silk warp being measured out. Custom order handwoven silk saori window panels. custom cotton and silk ombre wrap. A native of Metro-Detroit, Mary Ballard studied Fine Art at College for Creative Studies and Wayne State University. After working in the fashion and advertising agency for 10 years, Mary became a stay at home mother and began exploring Fiber Arts. With her own young children as inspiration, she began handcrafting felted toys and selling with etsy and local shops as Pip & Olive. Pip & Olive was featured on The Huffington Post among many other well known blogs. As her children grew, Mary found herself drawn to weaving - an art which had fascinated her since a childhood visit to Cranbrook's weaving studio. Drawn to the intuitive style of Japanese Saori weaving combined with her understanding of color and texture, she threw herself into learning all she could and Goldfinch Woven was born. Based out of Mary's Metro-Detroit home studio, Goldfinch Woven specializes in one of kind wearable art weaving utilizing the highest quality natural and eco friendly materials. My journey began studying Fine Art with a concentration in painting and printmaking at CCS in Detroit. In the past several years I've immersed myself in the world of fiber arts- fascinated by the process and possibilities.